Over the previous three decades Wisconsin has retained several elite rushers (and offensive lines) to amass several conference championships and Rose Bowl appearances. Even when acknowledging Taylor’s case as a serious Heisman candidate in each of his first two years, proclaiming him the presumptive best running back in Wisconsin football history still feels like a bold proclamation. Let’s investigate! The second accesses single game statistics from 2000-2018. In order to generate visualizations we’ll first need to complete some slight reshaping and data cleanup. 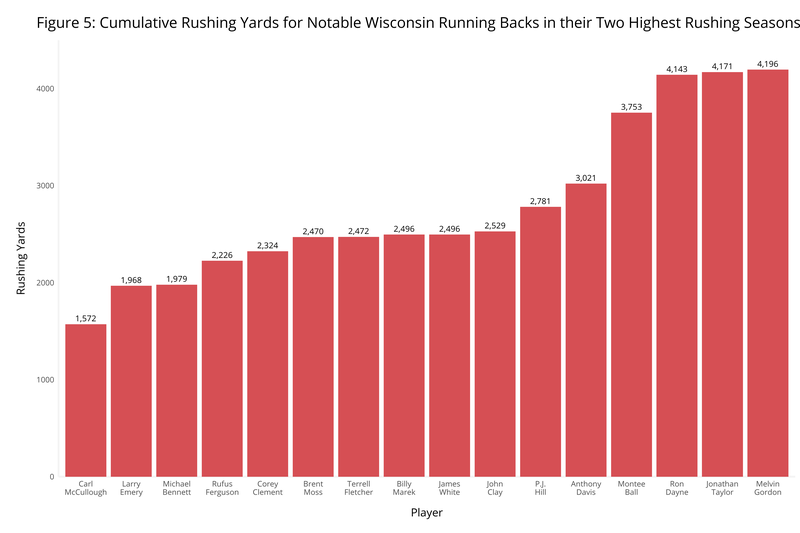 Since the box scores don’t contain much supplementary information, we’ll instead construct a few dplyr filter conditions to create our data set of best rushers in Wisconsin history. 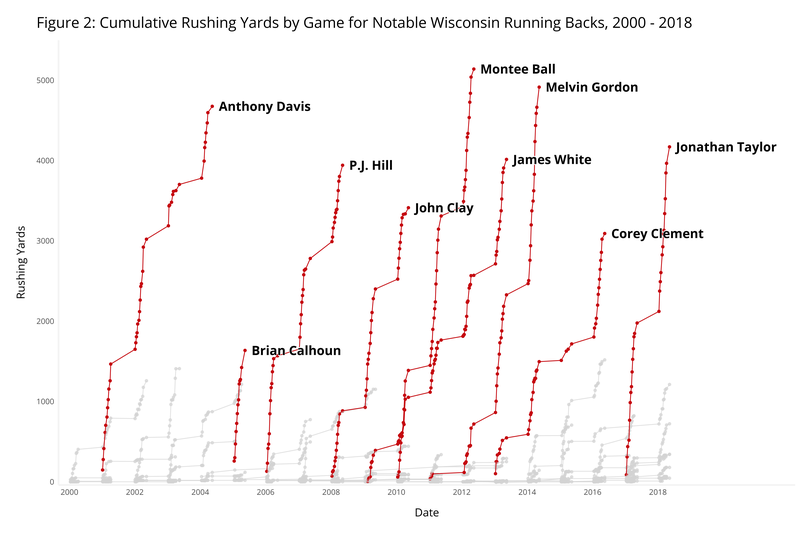 Wisconsin has employed an incredible sequence of successful running backs since Barry Alvarez breathed life into the program in the early 1990s. Ron Dayne, Montee Ball, Melvin Gordon, and Taylor have each finished in the top 10 of Heisman voting - Taylor doing so twice - while also winning the Doak Walker Award for the best collegiate running back. 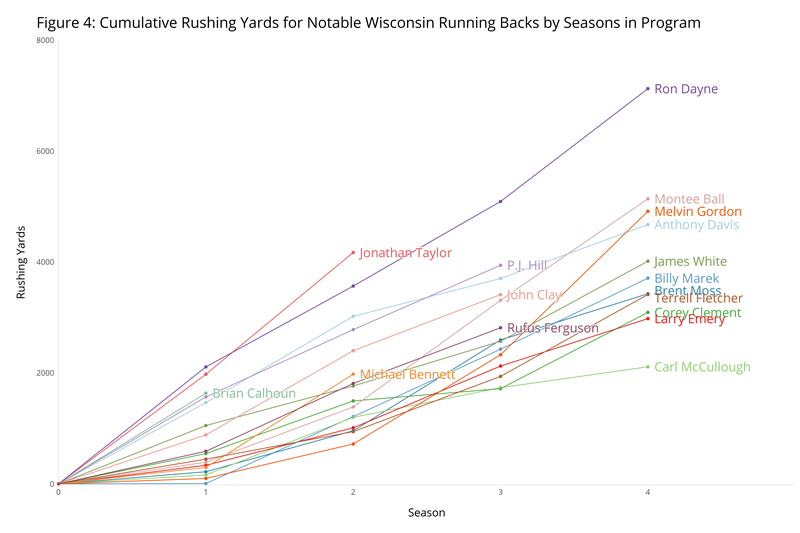 As displayed in Figure 1, the four-year production of Ron Dayne stands out from the recent crop of running backs. Dayne’s contributions on the field resulted in breaking the FBS career rushing mark (since eclipsed, controversially) in 1999, and he deserves some credit for establishing the class of running back commit Wisconsin is able to sign to this day. Taylor stands on the shoulders of a legacy of elite rushing prospects. 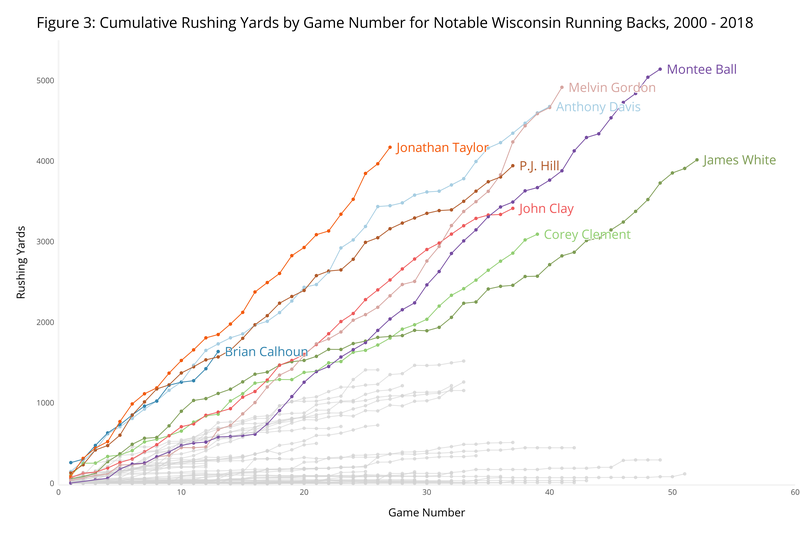 Looking more closely at single game rushing data over time in Figure 2, Taylor fits in neatly with his fellow Badgers - he is equal in stature to the best recent Wisconsin running backs. It’s incredible to reflect on the 2011 data points signifying a Wisconsin team that fielded Montee Ball, James White and Melvin Gordon (albeit for only 3 games) simultaneously! Brian Calhoun had a monster first game as a Badger - 258 yards rushing against Bowling Green! In fact, when compared to all Wisconsin rushers in their first two seasons (regardless of academic standing) Taylor’s are the most yards all time. As seen in Figure 4, it’s not particularly close! He is comfortably on pace to accrue more rushing yards than all Wisconsin running backs (aside from Ron Dayne) by the end of his junior season. If he returns for his senior season, the FBS career rushing mark might be in reach. 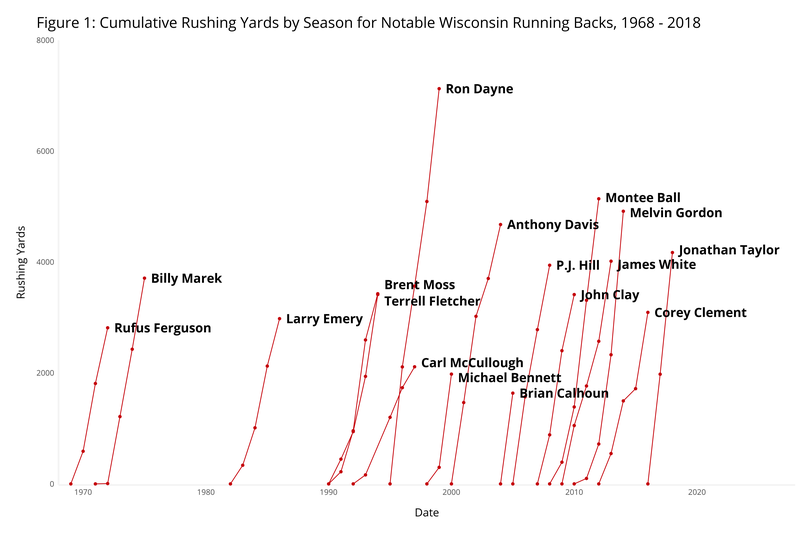 Figure 5 displays the top two rushing seasons for notable Wisconsin running backs during their careers. The total rushing of Taylor’s freshman and sophomore campaigns stack up as the second highest total of the any of the two best seasons of all Wisconsin running backs. Jonathan Taylor has chewed up yards - and the best might still be to come.